It's always smart to buy kitchen supplies or ingredients like olive oil in bulk, but the giant jugs are a little unruly to pour and a little unsightly to keep on the counter. This project is a cheap, easy, eco- and budget-friendly way to solve all those problems. 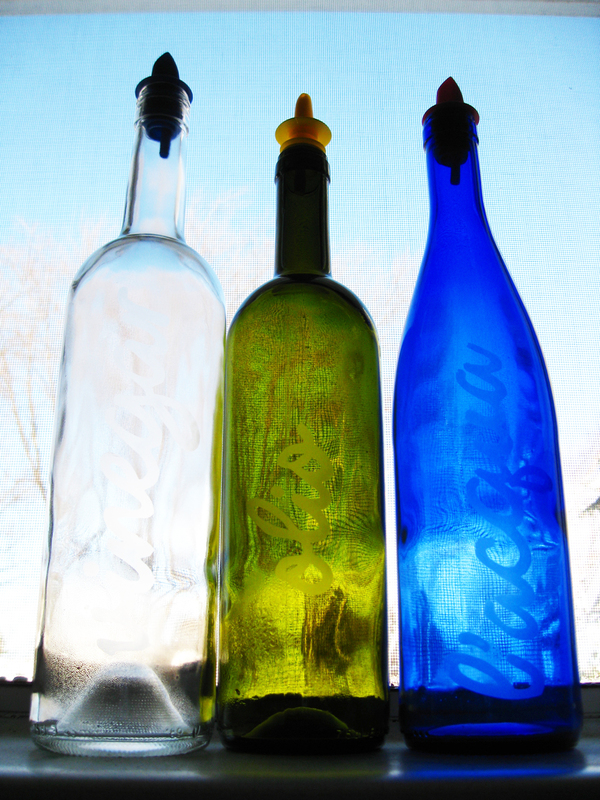 The bottles can also be used to store dish-detergent, vinegar, beverages, and other condiments. You can etch anything on them, words like I did, or pictures to match your decor, it's all up to you. Trace or draw your image on the contact paper. Cut out the letters using the blade, being careful not to cut yourself. Clean off glass according to etching paste instructions. Peel off contact paper and wash and dry thoroughly. Fill with liquid and put on pouring top. 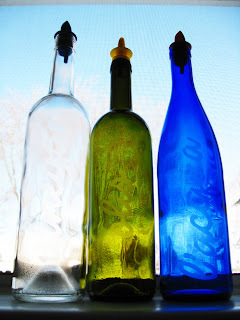 ALSO: Check out my friend Sarah's blog at Simply Step Back to see her glass etching project! I have to ask. Do you have a stainless steel sink? I do have a steel sink in the kitchen (which is where I did this project). The etching cream doesn't come into contact with the sink very long though, the paste is applied to the glass and sticks there pretty well. We set ours on an old towel to keep them horizontal rather than vertical, just in case it drips. The only time the etching cream would be in the sink would be when rinsing the brush or the bottle. I'm guessing that you could throw away the cheap brush, or rinse it in a cup, and wipe off most of the cream before putting the bottle in the sink. That way the etching cream would be VERY diluted by the time it came in contact with the sink! Hope that helps! This is a fun project, and especially fulfilling because of the instant satisfaction of it all.